Hi YNAB team. Love the product. Wanted to let you know that American Express doesn't seem to be correctly importing. This seems to be a known issue with Mint at the moment as well. I took a look, but I'm currently seeing a successful connection to American Express, with transactions that last imported today. Are you still seeing trouble with your account? I can also confirm transactions are not importing. Sent an email to support with supporting pics. Still having issues! Thank you for looking into. Any updates on this.... blocking my budgeting! Any updates? It continues to say the connection is good and it's updating when I log in, however, it's not actually importing anything. Sorry for the delay here - we fell a bit behind with the holiday weekend. I reached out to our Direct Import partner to see if they can update us on where they are with their investigation. We'll let you know once we hear from them! Hello, came to the forum because of this issue. American Express transactions have not imported for me since the beginning of november. Since you have transactions you know have cleared your bank over 24 hours ago, but they are not available to import, try following these steps to remove the connection and re-link the account. If you have other accounts associated with that connection, be sure to reconnect those, too! Faness I can confirm that the transactions are still not importing even after removing and then relinking the account. I tried this fix over a week ago and still have nothing importing. Matt H The issue on your account connection is separate from what I'm seeing on Green Sound's account. Our Direct Import partner is seeing your transactions import on their end, but we're not seeing them carry over to your account so we've escalated that issue to our developers. Mine seemed to stop importing about Nov. 5. Never showed any connection failure. Transactions just never showed up. Have you had the chance to try refreshing the connection to that account? 2. Then Remove the connection(s) to this financial institution, confirm removal and close the window. 3. Hover over the existing account(in the left sidebar) and click on the edit icon. Faness I just tried this for my Amex issue. I did not resolve it. It says "The login information wasn't recognized. Try logging in to your institution directly, then try again here." I can log into my institution directly with no issue. This has been going on for over a week now for me. I've uploaded a screengrab. Hi Jeremy B ! I'm sorry you're having trouble with that American Express connection. I see that you also wrote in via email. One of our Direct Import Specialists will be in touch there! We're on our holiday break, so most of the team is away spending time with their families. It may take a few days, but we’ll follow-up as soon as possible! It didn't work the first time, but I tried it again and things seem to be coming down. Hi Tan Tape ! I'm glad you're seeing those transactions come in. Let us know if you run into any other trouble! So, I was noticing this problem as well, starting around December 2, 2018. I went to unlink and relink the account and found that the name of the linked account had changed from "****PartialCardNumber" (obviously with an actual number) to "NameofMyParticularFlavorofAMEX"
Horatio Spifflewicket I can confirm that this is happening with my AMEX as well. Have tried all the normal connection troubleshooting but it still persists. It shows three accounts, one with a $0 balance and two which reflect the current balances on mine and my wife’s respective cards (both users on same account). None import transactions however. I'm going to reach out from help@ynab.com so we can get the ball rolling with our Direct Import partner! I just looked more deeply into mine (now that I'm on PC instead of mobile) and I've noticed that the choice I made while linking seems to have imported all my transactions but none of my wife's (on her card). So I'm not seeing a complete picture yet here either. I still think this is a result of changes on the AMEX end, but I hope it can be worked out soon. Faness Same issue for me. We have two Amex cards, and none of my wife's transactions are importing, but mine are. Any help or info is much appreciated! We've recently learned that Amex seems to be unique in the way they issue cards for joint account members because they have different account numbers for each even though they're technically the same account. We've reached out to our Direct Import partner about this, and while they are looking into handling it differently for those Amex accounts with multiple card holders, as of now they only allow for separate connections to each of these credit card accounts. 1. 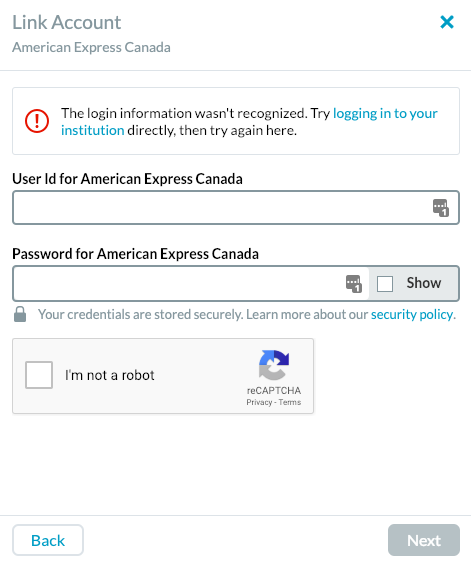 You can create another Amex account for the secondary card holder using their login credentials and connect it separately so it imports transactions that were made on that card. Make sure it has the same start date as the main Amex account, and change the starting balance amount to 0.00. When transactions import, you can then move them to the main account by selecting the transactions and going to Edit > Move to Account. Once you import the transactions, you'll want to change the starting balance transaction to today's date. This will prevent the majority of those transactions you just imported and moved over to the primary account from importing a second time to the secondary account. 2. Alternatively (and recommended) you can connect one budget account to the most active card and use File Based Importing to fill in the gaps for the rest. The good news is it's super easy to download a QFX from Amex (it's the "Quicken" option), and then drag and drop a file containing your transactions right into YNAB. Even if transactions are importing from one card, when you drop in the QFX of the entire account, it will skip over the ones you already imported—no need to worry about duplicates! I'm sorry -- I know neither of those options are quite as ideal as being able to have it all import into one account! I've made sure to let our Direct Import partner know that this situation is in no way ideal for our fellow YNABers, and I'm hoping they'll consider changing this (if possible!) in the future. Let me know if I can help with anything else or if you have any questions about all that. Faness Thanks so much for the info! Yes, that's annoying, but hopefully a fix can be worked out. I appreciate you letting the Direct Import partner know. For now, we'll stick with the file based import. Many thanks for your help!